HEINE® XP Emergency Set with XP Disposable Blades. Specially-developed for emergency-use featuring the HEINE XP® Disposable Laryngoscope Blades. Blade with integrated fiber optic bundle. The HEINE XP Emergency Laryngoscope Set is complete with the 5 most frequentlyused blade types and sizes for infants and adults. Instantly-ready for use with F. SP Handle and replaceable batteries. Comes with blades Miller 0, Miller 1, Mac 2, Mac 3, Mac 4, F. SP Handle 2.5 V, two alkaline batteries, in case. 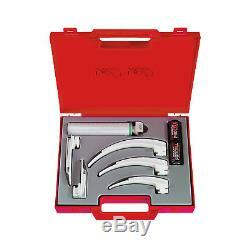 The item "HEINE XP Emergency Laryngoscope Set with Case New" is in sale since Sunday, January 21, 2018. This item is in the category "Business & Industrial\Healthcare, Lab & Life Science\Medical Instruments\Exam & Diagnostic\Laryngoscopes". The seller is "medilicious" and is located in Toronto.